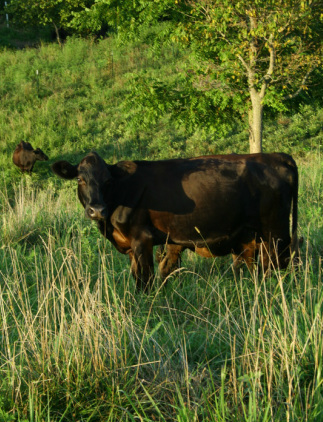 selective breeding and culling of the herd, we consistently maintain 25 brood cows for beef production. spring and fall calving season means spring and fall butchering. never feeding antibiotics or giving hormones. feeding locally grown grain the last two months to enhance marbling of the meat but ALWAYS on pasture. dry aging beef for 10 - 14 days; Natural enzymes in the meat breakdown the fibers, enhancing the taste with a delicious robust, beefy flavor and tender texture. Having all beef USDA inspected and sold by the pound.